Butler, Party of 4: Are you a SEEKER?? One message that is being drilled in me from many angles right now is to “be a seeker.” When I hear something once, I listen. If I hear it a few times, it catches my attention. When I hear something over and over from many people whom I greatly respect, you better believe I’m going to act on it. Between our leaders in AdvoCare, to our Sunday school teachers, to reading it in The Best Yes: Making Wise Decisions in the Midst of Endless Demands , the concept of seeking wisdom is being brought to my attention over and over. Andy Andrews also shared it in The Traveler's Gift: Seven Decisions that Determine Personal Success . It’s the second of the seven decisions. There is no shortage of wisdom available to us, but many times we aren’t making the choice to seek it until it’s too late or some damage has been done. The best time to seek wisdom is NOW. It’s much wiser to go to a marriage conference before there are issues than go to a marriage counselor after the issues arrive? It’s much wiser to study the Word about what God expects from us ladies as a wife and mom rather than listening to the world & have a failing marriage or wayward children? It’s much wiser to invest in your health now than pay through medicine, illness, or disease down the road? It’s much wiser to spend time educating yourself on financial matters now than to look up years from now and not like where you are and wonder where your money went? I’m not the smartest gal you’re going to meet, but I do believe in common sense. And to me, it’s just WAY more logical to focus more on preventative measures than solutions to problems that could have been prevented in the first place. The problem is, we live in a society that would rather be entertained. People would rather watch t.v. shows or play games that add ZERO value to their life than spend time learning. As The Best Yes says, “we’ve got to train our wisdom muscles to be strong and capable so when we need them most, we’ll know how to use wisdom” (p. 108). If you think about your dream life…your dream job, family, ministry, health, relationships, etc., WHAT are you doing today to help you get closer to making those a reality? If nothing changes, nothing changes. If you don’t do anything differently than you’ve been doing, how can you expect to get different results? The only way for something to change is to change our actions. The only way to change our actions is to change our thinking. And the only way to change our thinking is to change what we are allowing into our mind. We have to actively seek wisdom and practice it. “The direction you are currently traveling- relationally, financially, spiritually, and the list goes on- will determine where you end up in each of those respective arenas. That is true regardless of your goals, your dreams, your wishes, or your wants. The principle of the path trumps all of those things. Proverbs 27:12 tells us that “The prudent see danger and take refuge, but the simple keep going and pay the penalty.” Andy Stanley breaks that down so well. I have found that the more I focus on growing and seeking wisdom, the more aware I become of my own weaknesses, and the more I thirst for knowledge and the Lord’s help to strengthen those areas. Memorizing Scripture has personally been another great tool for me in this area. I can’t think of anything more powerful than drawing on the truth of God’s Word to help me. **Are you a seeker? 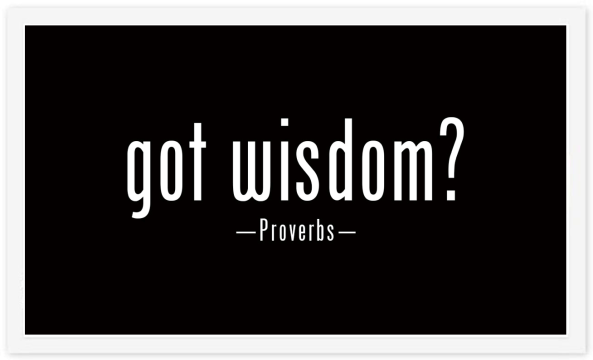 What are you doing on a daily, weekly, monthly, and yearly basis to seek wisdom? Where & from whom are you seeking wisdom?? I just have to tell you how much I appreciate all your posts! I have always believed in God, and have attended church regularly since I was a kid but I never put much effort into it until I met my boyfriend. He invited me to his church in March 2014 (he is cathloic, & i was raised christian) and since then I feel like my relationship with God has become stronger. It's not perfect but I learn something new everyday. Your blog has helped me tremeduously as well! I love all of your posts about being a Godly wife because one day when my boyfriend and I get married I want us to have a strong Godly marriage! I look forward to your future posts and just wanted to say how blessed I feel to of stumbled upon your blog!